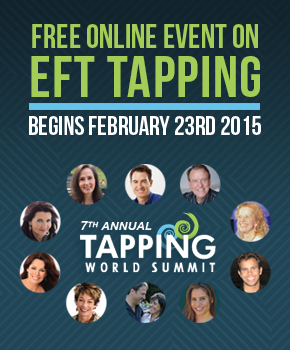 It is that time of the year again (I can't believe January is gone alredy) and the The 2015 Tapping World Summit is starting on the 23rd of February 2015 .This is the 7th Tapping World Summit conducted by Jessica and Nick Ortner. Having done a course with Jessica and Nick this year I can honestly say that they over deliver, even after the course has already finished. tapping for stress Do not miss it! The Tapping Summit commences on the 23rd of February, but you need to register to be able to listen to it. Registration is NOW OPEN. Please register here. So what is Tapping? Tapping is a technique that makes uses of meridians to clear blockages of energy that you may have. This blockages can keep you stack in different areas of your lives. Theseblockages can manifest as physical pain, emotional pain, fear, phobias, procrastination, depression and any other emotional problem you may be facing. The summit lasts for 10 days, during which Jessica will interview two experts per day on different topics. Some of the topics that were addressed in previous years were Weight loss, Financials, Chakra healing, physical pain, emotional pain and relationships. There has been also an interview on how to tap for children, very handy when you have kids, or if you deal in any way with children. Tapping has been applied by some teachers at school with marvelous results. If you register early, as soon as the registration open, you can have access to additional videos with lots of wisdom. Just these videos can teach you lots about tapping. These extra videos will start on the 2nd of February. Some of the experts that have previously participated in the summit are Louise Hay and Wayne Dyer. Both are well known in the Self development arena, and both are very wise people to listen to. There seems to be some mistake with the event calendar. I will update it as soon as I get clarification. In the review I mentioned that the Summit is completely free and that is true.So how would you listen to the interviews? Once you register here, I will send you an email as soon as The Tapping World Summit registration opens. Then you need to register with the Summit. Once you register, you will get an email with the opening interveiws. That will start soon on the 2nd of February, but the actual Summit commences on the 23rd of February. You still do not want to miss the launch interviews as those have lots of wisdom in it. This year Launching videos include an interview iwth Dr. Christiane Northrup, author of Women's Bodies, Women's Wisdom. Once the Summit starts, you will get an email everyday informing you about the latest interviews. The interviews normally take place at 8:00pm Easter Time. But do not worry if that time is not convenient for you. You have actually 24 hours to listen to them. Just open the email you receive and click on the link. The link will take you to a page where you have access to the Green and the red room. Listen to the interview at your leisure. Make yourself a favour and do not miss them. You can learn to tap just by listening to the intervew. The next day you will get another email advising you about the next set of interview. I really encourage you to diarize the interviews and take them seriously. Once you learn how to tap, you can tap on your own, every day, or whenever you need it. You can tap while watching TV, sitting in traffic or even if you are experiencing a problem at work, you can quickly go to the restrooms and tao fir two minutes. I have also tapped in my mind when I do not wnat other people to think that I am weird. I really encourage you to diarise the interviews and take them seriously. Once you learn how to tap, you can tap on your own, every day, or whenever you need it. You can tap while watching TV, sitting in traffic or even if you are experiencing a problem at work, you can quickly go to the restrooms and tao fir two minutes. I have also tapped in my mind when I do not want other people to think that I am weird. Take it seriously, and your life may never be the same. If you do so something will trigger, some emotion will come up, and you will be able to release it . You can read my review of the 2014 Tapping World Summit,If you want me to let you know when the 2015 Tapping World Summit Registration opens, please enter your email address below. I will be revieweing the interviews as they happened. SO even if you cannot listen to the interview, you can always come here and read my review. And I am open for questions. You can always email me. I am actually doing my certification to become and EFT practitiioner.